Portion Shockers - statistics that will blow you away! 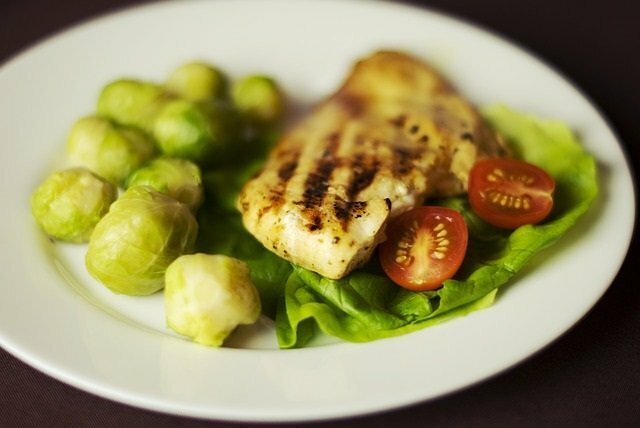 These portion shockers are taken from a great book written by Lisa R. Young, called "The Portion Teller, Smartsize Your Way to Permanent Weight Loss." Lisa points out over and over again that until you learn the Lifestyle Solution of estimating portions, rather than counting calories, weight control will be difficult. Her book is very fun and filled with eye opening facts, information, and an amazing chart showing the size increases in fast food by the year! 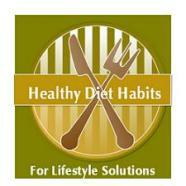 She gives you amazing healthy diet habits and tips to recognize portions. Pictured at right: Angelina Tamayo, from Roseville, CA - college graduation celebration! 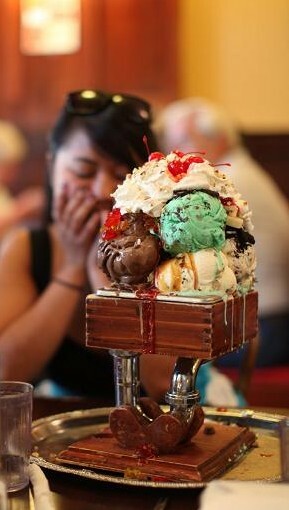 "The Kitchen Sink" from San Francisco Creamery, Co. - described as by them...."We throw everything at you with this gigantic sundae served in our own specially made sink! We take three sliced bananas, scoops of your choice of up to 8 flavors of ice creams, 8 servings of toppings, mounds and mounds of whipped cream, chopped toasted almonds and cherries. Serves one (if you dare) to six people. Perfect for birthdays and special celebrations. Includes a picture to take home and one on our Wall of Fame - $39.95"
Fortunately, Angel had six friends to help her, including my nephew Ryan, and his wife Marlene to the right of the picture. 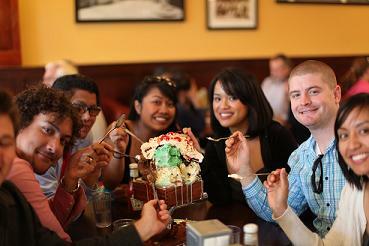 This is the smart "Lifestyle Solution" to split a dessert or share with a friend(s). A queen-size bed is now 6 inches wider than it was in the 1970’s. Yankee Stadium was built in the 1920’s and it had 82,000 seats; the remodeled version has only 49,000 seats. The French croissant doubles in size when baked in America. A typical muffin weights in at over 6 ounces and comprises more than an entire days worth of grains recommended by the Dietary Guidelines. Some deli sandwiches contain 1 pound of meat, about three days’ worth of meat recommended by the USDA. Portion sizes in American eating establishments are 25% larger than they are in Parisian eating establishments. 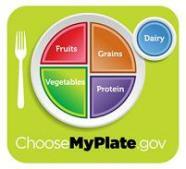 Nearly 50% of every food dollar is spent on foods and meals away from home according to the USDA. In a survey conducted by the American Dietetic Association, more than 50% of people overestimated a standard serving size of pasta. The Centers for Disease Control and Prevention announced that due to the increasing weight of Americans, U.S. airplanes consumed an extra 350 million gallons of jet fuel in 2000, costing the airline industry $275 million a year. In 1955 McDonald’s sold one size of fries, which weighed 2.4 oz, but today the sizes are small 2.4 oz, value size 3.7 oz, medium 5.2 oz, and large 6.2 oz. In 1908 the first Hershey Milk Chocolate Bar weighed 0.6 oz, but today Hershey Foods markets 12-ounce bags of individual snack-sized chocolates that weight 0.6 oz each, the exact same size as the original chocolate bar sold in 1908. The first Burger King hamburger weighed 3.9 oz for the entire burger. Today you can choose 5 sizes with the largest being the Double Whopper that weighs in at 12.6 oz. There are just a few of the alarming portion distortion statistics that show how we have been supersized as a nation. It has been little by little over the years. We do not notice that our portions are 3 to 5 times greater than we used to eat. Until we learn portion control and learn to reduce our portions, the weight game will be just that, a game that we are playing, but will not win!